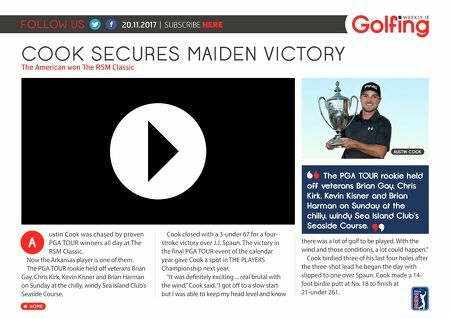 FOLLOW US HOME 20.11.2017 | SUBSCRIBE HERE COOK SECURES MAIDEN VICTORY The American won The RSM Classic AUSTIN COOK A The PGA TOUR rookie held off veterans Brian Gay, Chris Kirk, Kevin Kisner and Brian Harman on Sunday at the chilly, windy Sea Island Club's Seaside Course. ustin Cook was chased by proven PGA TOUR winners all day at The RSM Classic. Now the Arkansas player is one of them. The PGA TOUR rookie held off veterans Brian Gay, Chris Kirk, Kevin Kisner and Brian Harman on Sunday at the chilly, windy Sea Island Club's Seaside Course. Cook closed with a 3-under 67 for a four- stroke victory over J.J. Spaun. The victory in the final PGA TOUR event of the calendar year gave Cook a spot in THE PLAYERS Championship next year. "It was definitely exciting ... real brutal with the wind," Cook said. "I got off to a slow start but I was able to keep my head level and know there was a lot of golf to be played. With the wind and those conditions, a lot could happen." Cook birdied three of his last four holes after the three-shot lead he began the day with slipped to one over Spaun. Cook made a 14- foot birdie putt at No. 18 to finish at 21-under 261.